Rather than printing the label sheet yourself, you can email a pdf file containing the label information to someone else. Perhaps you don’t have a printer, or your printer is faulty. It would then be possible to print the labels from an application on the recipient’s computer e.g. Preview on a Mac. When you print your labels from Preview (or any suitable pdf printer application such as Adobe), it is very important that the setting are such that the information in the pdf file is not scaled or have margins applied. The information must be printed exactly as created by AddressLabels, otherwise the addresses will not line up with the labels. 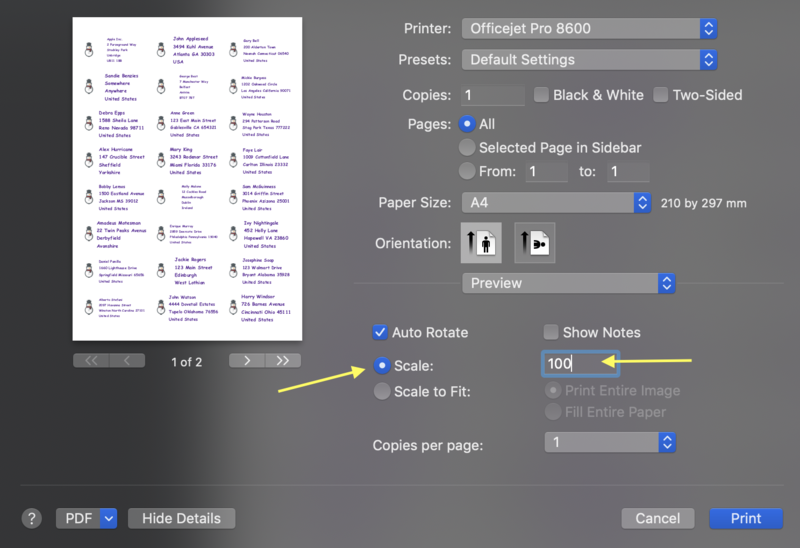 So, for example, in Preview, make sure the Scale button is selected, with the scaling set to 100, as shown.